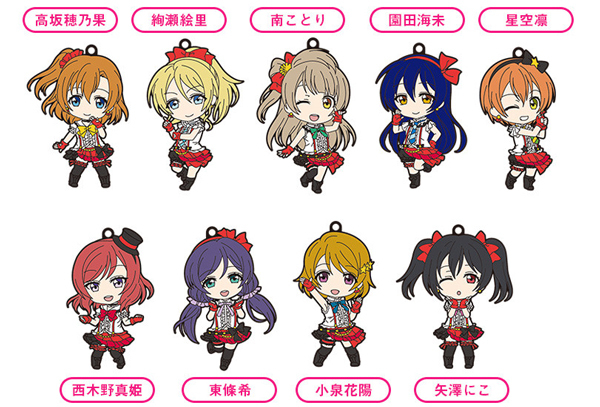 From the anime series ‘Love Live!’ comes a set of Love Live Nendoroid Plus Rubber Straps based on Nendoroid illustrations of the adorable μ’s members in their outfits from the "Bokura wa Ima no Naka de" stage by Good smile company Japan. The line-up includes all nine members including Honoka Kosaka, Umi Sonoda, Kotori Minami, Hanayo Koizumi, Rin Hoshizora, Maki Nishikino, Nico Yazawa, Eli Ayase and Nozomi Tojo! Attach them to anything you think needs a bit more colour and some Love Live! spirit! Images are for illustrative purposes only. Please note, these are blind boxes, so one box will be sent at random. Genuine Good smile Company Japan licensed merchandise.